And then Jilly said, "We're going to need a bigger suitcase." A suburban flat, somewhere in London. Interior, day. 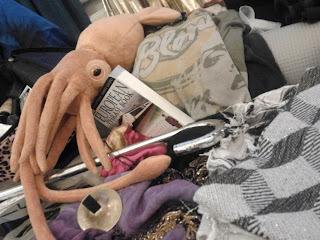 Jilly and The Raqasa are packing for RAKS. The Raqasa (TR): Jilly, have you seen my yoga mat? Jilly: You have a yoga mat? TR: Yeah, it's a purple one. I thought I'd stored it in the cupboard under the shelf you live on. Jilly: Darling, I have never seen you do yoga, much less use a yoga mat. Have you checked where you hide the cigarettes you don't smoke? Maybe the yoga mat you don't use is in the same place. TR: Shut up, Jilly. The email said to bring a yoga mat or a large towel. Since I have a yoga mat, I am going to justify the money I spent on it and pack it. TR: Ooh, here it is! Jilly: You said it was purple. Purple would have been nicer. The grey one looks like a roll of dessicated elephant hide or something. How can you bring yourself to lie on that? TR: I can't. I guess that's why I'd forgotten what it looked like. Do you know where my stick is? Jilly: This is going to be a long afternoon, isn't it? Have you looked in the top of your wardrobe? TR: (Perching on one leg on the edge of the bed's footboard so as to reach the top of the wardrobe) Look at me! I've invented 'bedroom Parkour'! Whee! Jilly: If you break your ankle looking for it you won't be going anywhere. Focus! The Raqasa spends a good long while searching the whole flat. TR: This is ridiculous! How can such a tiny flat have so many nooks and crannies? Jilly: Try the top of the wardrobe again. TR: Well ... will you look at that. Huh. Jilly: I'm going outside for a smoke. TR: Hang on a tick. I need you to come and sit in the bag. TR: To make sure there's room for you. Jilly: You're not serious! I'm not travelling in there. Your dance shoes stink. Besides, it sends the wrong message. It's like you're embarrassed to be seen in public with me. TR: Of course I'm embarrassed to be seen with you. I'm a grown woman lugging around a soft toy, fer chrissakes. TR: Sorry, Jilly. You know how it is. Jilly: I'm going outside to smoke. I may be some time. TR: Aw, don't be sore. I'll tuck some ouzo in next to you, how's that? Jilly: Look, I'll be back in five minutes. And you'd better damn well make some progress. Jilly: How's the packing going? AND WHAT THE SCALLOPS IS THAT? 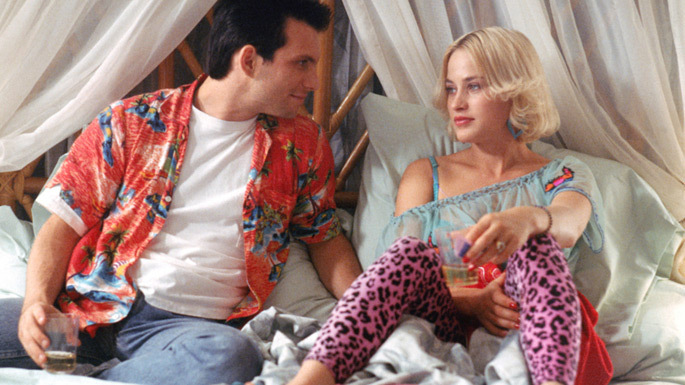 TR: It's my 'tribute to Patricia Arquette in True Romance' bathroom bag in fetching pink leopard print vinyl. Jilly: If I could narrow my eyes suspiciously at you, I would. Is it from Forever 21? Jilly: Did you look at the bottom of the carry bag? Jilly: Did you look at the horrors revealed about that chain on Wikipedia? TR: I won't go there again. Well, not before next pay day anyway. Jilly: Tsk. Really, I despair of you. All the facts are staring you in the face and still you can't walk past a £6 T-shirt. It's because of people like you that the world's in the state it's in. And I bet you haven't even packed underwear yet, have you? TR: Actually, I have packed some, yeah. But I bet some of it was made in sweatshops so will you still let me wear it? Jilly: Sarcasm is a very unbecoming shade on you, m'dear. TR: I'm only getting defensive because I know you're right. Besides, there are worse things I can pack, like coin belts. Why do people still wear them anyway? Ghastly, heavy noisy things. Perhaps I should sell mine... Hey, can we take a break? It's still sunny outside and we could go have a gin and tonic on the deck. Jilly: An idea so good it would give a jellyfish a hard-on. I'll cut the lemons. By the way, I'm not going to need a passport but you will. You know where yours is, right? Gotta admit, with an attitude like that Jilly would have gone in the case first; a few layers of pantaloons and tribal skirts would have muffled her pretty effectively! But then the rest of us wouldn't have benefited from her dry (sorry, is that appropriate?) wit! 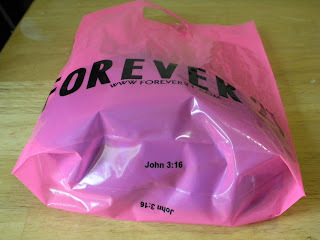 Thanks for the headsup on Forever 21 btw, will make sure I don't shop there! Oh, I would love to muffle her. Honest. But unfortunately she is sensible and organised where I am not! Hehe. Forever 21, eh? I knew all High Street shops were evil to some degree, but I didn't know about them until after I got home and spotted the bottom of the carry bag (and of course that led to some digging).